Colonic irrigation with High Strength Probiotic Implants and comprehensive consultation at the Parkland Natural Health Clinic in the centre of London. Colonic hydrotherapy is the process of cleansing the colon of many different types of bad bacteria and infections. After the colonic, people usually find that they feel lighter, happier and healthier. The colon can become infected with many different afflictions ranging from hemorrhoids, hernias and even cancerous cells. Here, in the centre of London, we help our clients' digestive tract gain probiotics that help their body be able to function more properly than ever before. 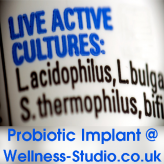 The probiotics are generally outnumbered by aggressive bacteria 20% to 80%, and that can be due to several reasons. Irregular bowel movements, chronic constipations, sedentary life, diets rich with carbohydrates, food poisoning and infectious diseases are all common issues that lead to bad and dangerous colonic ailments. The colonic irrigation re-trains the colon to become independent of foods that we eat, and it helps the colon to become stronger and function at a healthier level than ever before or imagined. When people rely on stimulants to trigger peristalsis, they are allowing their bodies to become breeding grounds for diseases and infections. Some stimulants include nicotine, caffeine and even herbal teas. While people generally know that some ailments can occur from these stimulants, most people are unaware of the effect that the stimulants will have on the colon, prostate and digestive tract. The initial consultation, here at our office, will help us inform you and decide on a cleansing regiment that will suit your body the best. We will perform the first colonic irrigation during the consultation. The initial colonic irrigation will help us discover what the best course of action will be, and the consultation will be a great time to ask questions and become more informed with how your body functions. Our goal is not to simply cleanse you one time, but we hope to help you be more knowledgeable of how to lead a happy and healthy lifestyle. After surgery for the removal of a brain tumour, I lost the brain-gut nerve connection The effect of which was to leave me in a state of permanent constipation. Over the years i tried all sorts of therapies and had exhaustive investigations and in the end was offered a Colostomy and a stoma, ie remove the colon and be fitted with an external pouch. Then I discovered the Wellness Clinic and found a saviour! Two things impressed me striaght away - the first thing was that Anatoli, had a real grasp of annatomy and secondly he possessed a wide knowledge of medical conditions that affect the bowels. He understood my condition and things startd to change from the first treatment.. It was like I had been liberated from a curse that had plagued me for twenty years! In the beginning I had an intense course of colonics and felt immediately like a new man. My old energy levels and postive outlook on life returned. The great thing was Anatoli was there to answer my questions and was always so full of encouragement. After 5 years of regular treatment, an amazing thing happened - I had a natrual motion! Somehow the gut-brain link began to flicker into life ... now I have a normal easy bowel movement almost every day. I still go to Anatoli for regular 'check-ups', but with his care my life has improved beyond measure.